SEE – YOU COULD BE A WINNER!!! According to ‘Action on Hearing Loss – formally the RNID (Royal National Institute for the Deaf)’ one in seven people in this country have a hearing impairment. Sadly I am one such person and when I suddenly lost a large proportion of my hearing a few years ago my world changed dramatically almost overnight. After I had lost my hearing my match day experience was somewhat different to what it had been. I could no longer hear what music was being played before, during or after the game, I could not make out what the announcer was saying over the tannoy system – the team names, match sponsors, what was happening at half time on the pitch, half time and full time scores and any important announcements like who had just scored for City (yes it happens occasionally). One of the other things I’ve missed out on is the winning number for the 50/50 draw, which, as a consequence, means I don’t buy 50/50 draw tickets.But wait – all that’s changed. 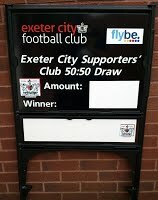 The Exeter City Disabled Supporters Association (ECDSA) whose aims are to improve facilities for disabled supporters of the club have got together with the Supporters Club, who run the 50/50 draw, to create a board which will be paraded around the pitch at half time showing the winning 50/50 number for everyone to SEE. So if you’re like me and can’t hear that winning 50/50 draw ticket number when it’s announced over the tannoy then the visual impact of the new board should solve the problem. I for one will now be able to purchase 50/50 draw tickets and contribute that little bit more to help our football club. Why don’t you do the same – SEE you could soon be a WINNER. Nick Saunders (Chairman); David Jones (Vice-chair & Membership Secretary); Jeanne Jones (Secretary); Margaret Atkins (Treasurer); Trevor Harwood (Press Officer); Colin Atkins; David and Juanita Turner. Plans are under way for this year’s Christmas draw and Tickets will be on sell from 29th September at a cost of £1 each. Draw to take place on 12th December. Details of prizes will be announced soon. Exeter City FC will be putting the focus on disability this Saturday (20 October) when they hold their annual One Game One Community designated game versus Chesterfield at St James’ Park. It is said that ‘first impressions count for a lot’ and ‘you never get a second chance to make a first impression’. 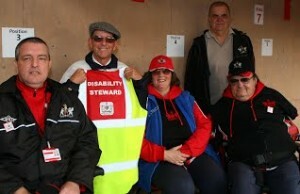 With this in mind, the Exeter City’s Disability Liaison Officer Nick Saunders (pictured far left) teamed up with the club’s Safety Officer Jim Eastment at the beginning of the season to create the position of ‘Disability Steward’ for match days. The role of the Disability Steward would be to help improve the match day experience for those with disabilities by providing a safe and friendly environment for them at St James’ Park. In time it is hoped that the Disability Steward would help to train other stewards in understanding the needs of both home and away supporters with disabilities. In this way a culture would develop which would express the clubs desire to continue to make St James’ Park a disabled-friendly place by providing a high level of care and support for those with disabilities. We are very grateful to Gerald Gibson, (pictured second left, with members of our committee), who has become the club’s first Disability Steward. He commenced his duties at the home game agains Chesterfield on October 20th, after which the club received some very positive feedback from the Spireites’ wheelchair users. Initially the role of the Disability Steward will be to concentrate on away disabled fans as they are new to the ground – checking tickets, advising them on entry, pointing out facilities, etc. – and also home supporters using the designated wheelchair bays. In time this will include all supporters with disabilities entering the ground. To help the Disability Steward gain recognition for their position, we have provided two reflective vests’ for Gerald and others to wear, so that people can easily identify the designated Disability Stewards. The club thanked us (ECDSA) and Gerald for the support given to disabled supporters whose first impressions on match days are so important to ensure they fully enjoy their match day experience. ECDSA committee members, David & Juanita Turner (left) have entered the Exeter City Charity Santa Dash and they will be raising funds for the Exeter City Disabled Supporters Association. 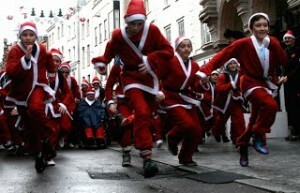 The Exeter City Football Club Charity Santa Dash takes place on Saturday 29th December, 1.15pm. Businesses enter teams to raise money for charity, and enjoy a great fun “team building” day, Charity organisations enter to raise funds for their charity and Exeter City Supporters enter and enjoy the unique atmosphere at the afternoon game with hundreds of spectators wearing their Santa Suits. For just £17 an adult and £5 a child, you will receive your Santa Suit and match tickets for the Barnet game, that afternoon. There is a £10 discount to adult season ticket holders. Small Child: Age 2 – 7. Jacket, trousers, hat & belt. Large child: Age 8-14. Jacket, trousers, hat, beard & belt. Adult Suits are all “Extra Large” with an adjustable belt, jacket, trousers, hat and beard. Director of the Day, at a game to be allocated. Hospitality for two, at a game to be allocated. A signed Exeter City Shirt. Seat in the Flybe Grandstand. Pre match meal in the hospitality lounge. Attend the post-match “man of the match awards” with player photo opportunities. All for just £35 per adult and £15 per child. Again a £10 discount to adult season ticket holders. Why not entry the Santa Dash yourself and join David & Juanita in raising funds for ECDSA. 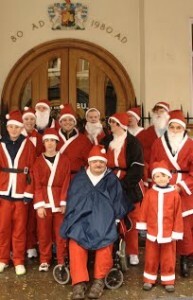 If you would like to enter the ECFC Santa Dash please email us and we’ll forward you a booking form. Ho, Ho, Ho . . . .Book soon . . . .
Our Christmas Draw took place on 12th December 2012. 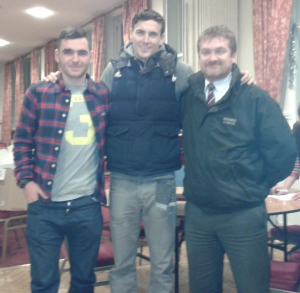 The draw was attended by city player and ECDSA President Alan Gow and city player Jake Gosling and Alastair Mills from the Grange of Exeter. We have made a fantastic amount from this years draw of a profit of just over £1500.00 and will be held for future improving facilites at St James Park for supporters with disabilities. We would like to thank the Grange of Exeter; ECFC; Original Style; Wales & West Utilities; Astley Media; greenmybusiness.co.uk; Subway of Sidwell St. for all their very kind donations and support and to all ECDSA committee members who donated prizes and not forgetting all those who have supported us both in purchasing and helping in selling draw. Bucket collection took place at the Northampton Town match on Sat 2nd March 2011. This is a fantastic amount and all made possible by the generosity of those who attended the match. This has allowed us to buy 5 new sets of waterproofs for those using area 5 in the Big Bank Stand as a roof can’t be put over the area because the back of the area is too low. We had 4 bucket collectors from our friends from the East Devon Grecians and just shows what sort of club we have. “Again supporters working together for each other”. Thanks also to Exeter City Football Club for again giving us the opportunity of a bucket collection. Thanks again to everyone for the support and help. In the aftermath of the team’s impressive 3-0 victory on Saturday 2nd March, 2013 the club received a communication from a Northampton Town wheelchair user in praise of the match day experience his carer and himself had received. He goes on to praise the ECFC Disability Steward “Once in the ground, we were met by a designated steward who was very explanatory and made us feel at home. The viewing area in the main stand was well positioned; it just made us feel so good for the whole day. In fact the courtesy shown by all the stewards we encountered was brilliant”. 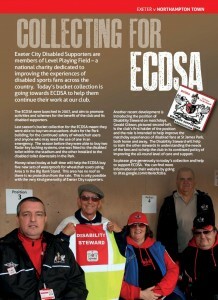 The role of disability steward was instigated by the clubs Disability Liaison Officer/ECDSA Chairman, Nick Saunders with support from the clubs Safety Officer, Jim Eastment and this feedback is a prime example of how the club and its supporters groups working together can improve the match day experience for home and away fans. Rowland Jordan also went onto thank the club for “making mine and my carers day a happy one” but didn’t mention the score of course although he did suggest that we might meet again in the play-offs. ECDSA would like to thank Rowland for his kind comments and feedback which is most welcome in our quest to provide a good match day experience for all suppporters with disabilities. St Loye’s Foundation has teamed up with Exeter City’s Football in the Community Charity again to offer you a great VIP Football Experience on Sat 20th April for the npower League 2 match against Cheltenham! The full amount will be shared equally between St Loye’s Foundation and Exeter City’s Football in the Community Charity. St Loye’s is a national charity based in Exeter offering over 75 years’ experience in training, developing and supporting people with disabilities, injuries and other health conditions. Their 50% will be used to increase opportunities for people with autism in Exeter & East Devon. Football in the Community helps around 50,000 adults young people and children in Exeter and throughout Devon by delivering programmes in education, social inclusion, health and sports participation. The charity encourages, inspires and includes people of all ages and abilities to get involved in sport. Please follow this Ebay link to make a bid. Thank you for helping to make a difference to other people’s lives and good luck! On a cold and somewhat windy December lunchtime when the taste of turkey was still fresh on the lips and the excitement of the game against Edgar Davids’ Barnet less than 2 hours away; Exeter City Disabled Supporters Association (ECDSA) committee members and husband and wife team David & Juanita Turner were lined up at the Guildhall ready for the annual Exeter City Football in the Community Charitable Trust Santa Dash to the Park. David‘s reindeer, having had an exceptionally busy Christmas, were taking a well earned rest so that left David having to rely on Juanita to push him in his wheelchair all the way to St James’ Park. “It was great fun” said Juanita “but by the time I got to John Lewis’s I was a bit out of breath – thankfully there were lots of other Santa’s around who helped me push David all the way up Sidwell Street”. (David can be seen at the start in his wheelchair with his wife Juanita standing behind). Thanks to the generosity of City fans and sponsors David & Juanita raised a fantastic amount of £201.00 for their efforts – 50% (£100.50) going to the Exeter City Football in the Community Charitable Trust and the other 50% going to ECDSA. This valuable contribution will go towards helping us improve facilities at the Park for disabled supporters of both home and away fans. ECDSA would like to thank David & Juanita for their fund raising efforts and for making the Santa Dash a success for both the club and for the Disabled Supporters Association. David & Juanita, through the crowd of young Santa’s just after the start of the dash. 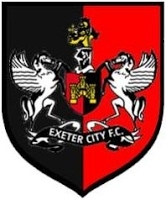 If you think ECDSA can improve your match day experience at Exeter City or you would like to get involved then please email us. We gave out our first award to the Exeter City player who in our view was the most improved player for the 2007/08 season. Since the start of our award it has been won by George Friend (2007/08); Dean Moxey (2008/09); Liam Sercombe (2009/10); James Dunne (2010/11) and last year was won by Scot Bennett. Members have been voting again for this season’s winner and the award goes to a player who has cementing his place in the first team and has improved the most in our eyes. Congratulations ‘Artur’ from everyone here at ECDSA. 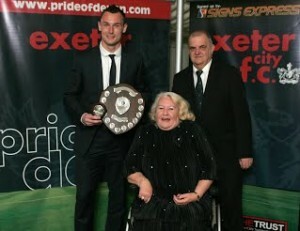 Award presented to Autur by David Jones (vice chair) and Jeanne Jones (secretary) at the Exeter City end of season ball. Trophies kindly sponsored by committee member Steve Gazzard. 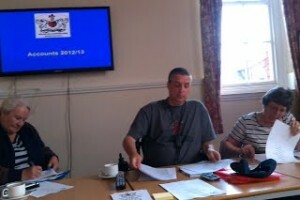 ECDSA’s 6th Annual General Meeting was held on Wednesday 3rd July in the Courtenay Room at St. James Park. Pictured from left to right: Jeanne Jones (Secretary) Nick Saunders (Chairman) and Margaret Atkins (Treasurer). Our Chairman reported a busy year for ECDSA which included, amongst other things, the establishment of a match day Disability Steward, assisting the club with markings for disabled parking places, working with the Supporters Club to establish visual boards for the notification of the 50/50 draw winning ticket number and providing input to the stadium development team of ideas which ECDSA felt should be included in any re-development of St James’ Park. Our Chairman also thanked all the businesses and individuals who had contributed prizes to our very successful Christmas Draw. Our Treasurer reported a successful year of fund raising activities including our Christmas Draw, which was by far our most successful to date, and the amount raised from our bucket collection at the Northampton Town game the proceeds of which were used towards the purchase of 5 sets of waterproofs for those using disability area 5. Roger Conway, was unable to attend the AGM but his report on the current situation regarding the redevelopment of the ground was read out at the meeting below. At the end of the meeting a presentation was made to outgoing committee member and fundraising officer Colin Atkins. As members will realise, following the excitement of the public exhibition and consultation in autumn 2011, things have been somewhat quiet of late and the reason for this is that the project has been badly affected by a number of factors, most of them totally out of our control. Firstly, rather than start to see the national economy recover, we have seen things get worse and that has resulted in lower confidence about the prospects of investment, especially by those who have the capital to do so. The Exeter City Chairman has been solid in his determination that the development only takes place if it is at no cost and no risk to the Club. In other words we can only do it if we can raise money by some joint arrangement that allows someone else to build on the portions of the site that we don’t need for Club use and who will give us enough money from this arrangement to re-build the Old Grand Stand, develop the Away end and re-develop the St James Centre (the park). Since 2011 we’ve been working hard to set up that type of arrangement. At the beginning we were looking to ‘cash in’ on the growth of student housing and felt that our geographical position of being equal distance from the University and the City Centre was a special attraction as was the possibility of providing fitness and sports facilities that could be used by the students when our teams were not using them. However, as I’m sure you are aware, the ‘bubble burst’ and suddenly there was too much student housing for the current demand and there are currently some providers who are having their ‘fingers badly burned’. We think that we had a lucky escape, because had we got started on that project we would now probably have a lot of empty flats on site, but no money coming to the Club to do our development. The next avenue looked at was general mixed housing and a joint project was assembled that included us, the City Council, a Housing Association, A Pension Fund, A developer and an Architect. A scheme was designed and costed and all looked ok. However, there were some serious Town Planning issues and the changes that the Local Authority required meant that the scope of the housing development was much reduced and consequently so was the ‘contribution’ available to use for the stadium works. It was so much lower in fact, that the Chairman’s maxim of ‘no risk and no cost the Club’ was impossible to achieve, so we walked away. Since then we’ve been exploring a range of other options and at last the hard work is showing some real and exciting results. In the next couple of weeks we should be able to disclose the first of those results that will enable us to start driving forward again. It goes without saying that ECDSA will be consulted at the detail stages in the design process and I will keep you informed as to when that will be. At the same time, in conjunction with the City Council, we are exploring options regarding the replacement of the Old Grand Stand. It is very early days in those discussions and there is nothing of substance that can be reported at the moment. We will get there eventually and you can be assured that your voice will be heard and your interests safeguarded whatever scheme we eventually achieve. Hello & welcome to this the 6th Annual General Meeting of the Exeter City Disabled Supporters Association and the following is my Chairman’s report. Our association has been going for 6 years now and last year was the first time our membership had not increased. As I stated at last year’s AGM, our aim was to get to the 100 mark, which is still our target. We are already working on ways to boost membership and hopefully our membership take up improves in the coming season. We continue to have strong ties with other supporter groups and one of those groups ‘One game, one community’ had Disability as their theme as part of their national ‘kick it out campaign’ and it’s great that other groups are thinking about disability and not just ourselves. 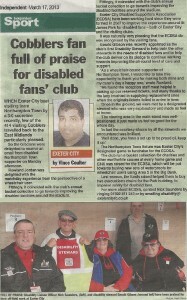 This has made people more aware of what Exeter City and ourselves have to offer those with disabilities. 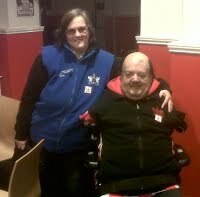 We’ve also been able to setup ties with some local disability organisations namely the St Loye’s Foundation and Pluss of Exeter, this ensures we’ve a wider reach within the local community in promoting what we do for our football club and those with disabilities and what Exeter City has to offer people with disabilities. Not just on a match day but also through the week through disability football opportunities. Level Playing Field membership: We continue to be fully paid up members of LPF and this ensures that if any major disability issues came up within the football club or other supporter groups, that they can come to us and we can then contact LPF for help. ECDSA President: Alan Gow kindly became our President due to Billy Jones leaving the club last summer. We again sponsored our presidents training kit and now have a signed training top from Alan as part of our sponsorship package with the club. Stadium redevelopments: We compiled a Priority List. We worked on a list of ideas that we felt should be included in any redevelopment here at Exeter City and we then prioritized what we felt was more important to us as a group and then we submitted this list with Roger Conway as a member of the redevelopment committee. Disabled parking marking: With our input the football club got the disabled parking places across from the club shop fully marked up so people can see that these spaces are for disabled parking only. The Fountain Centre has been taken over by Football in the Community and they’ve fully marked out the old playground area for parking and have include disabled parking spaces, we thank FITC for doing this as disabled parking does get missed and we are always wanting more spaces. 50/50 boards: We got two boards for the Supporters Club to use at half time so those with a hearing impairment can find out the result of the 50/50 draw and in doing so encourage more people to buy tickets. However, this has not worked out as we hoped and over the past season we’ve been trying very hard to get the issues sorted out and we are hopeful the issues are ironed out in the coming season. Ability Counts sponsorship: We were able to get hold of two fully stocked first aid bags as they needed new first aid kits, we used this as way of sponsorship. The clubs physio at the time kindly helped us with this. Disability day: We worked closely with one game, one community on their Disability Day. Ability Counts raised a fair amount through a bucket collection on the same day, Colin kindly collected upstairs for them. Designated disability steward: After years of trying the football club finally agreed to install a match day disability steward. To help, we bought two high visibility vests so that supporters can see who the disability steward was. The great news is that the installation of the disability steward has been a resounding success and we’re sure this will continue next season. * The Grange of Exeter again kindly donated a Jaguar car for the weekend. * Exeter City FC donated Match day hospitality for two and a Signed football. * Original Style donated an Electric tile cutter and a Bottle of whisky. * Wales& West Utilities donated a 7” Tablet PC; Tom Tom sat nav and a Digital camera. * Astley Media donated a Champagne bucket. * greenmybusiness.co.uk donated a £30 Credit voucher. * Subway of Sidwell Street donated 3 Subway vouchers. * The following was donated by our committee members: Blu-ray player & 5 films; 12 bottle case of wine; Napoleon extra old cognac; Tins of sweets and Christmas crackers. * Extra items bought by ECDSA: Fair-trade Christmas Hamper and a Russell Hobbs Ball Chopper. 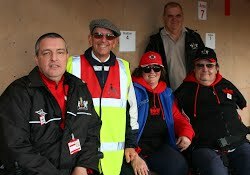 Bucket collect: We raised a great amount and bought 5 new waterproofs for those using area 5 in the Big Bank stand. Our thanks must go to the East Devon Grecians for helping us find extra bucket collectors. Most Improved Player award 2012/13: Our members voted for whom in their eyes improved the most in the season and the award was presented on our behalf at the clubs end of season ball by Jeanne& David Jones to a worthy winner: Artur Krysiak. Match day disabled parking: We continued to allocate disabled parking on behalf of the football club. This ensured that all disabled parking spaces were used on a match day and we were only unable to fill 3 spaces over the season. South West Disabled Fan’s Experience Forum: The second forum took place at Yeovil Town and most of our committee attended. The next forum is being held at Swansea City later this year. Myself and David Munn from Yeovil Town DSA will be getting started on this one very shortly. We did hear at the Yeovil forum that the Football League and Level Playing Field are interested in setting up similar forums around the country. My report for the Yeovil forum can be found on our website. As you can tell from the above list, we’ve been very busy again in the past year as you would expect. I’ve revised the clubs Disabled Supporters’ Policy because disability guides are always changing and I found that the clubs policy was out of date and needed changing. Who is required to be accompanied by a personal assistant? Others with disabilities being accompanied by another person with a disability. The new policy has been approved by the clubs directors and is now in force and will be up for review again in 2015. The policy can be viewed through ours or the clubs website. The implementation of the Designated Disability Steward. I can also report that from this coming season for the first time ever, all supporters with disabilities will be able to buy all their match day tickets via the football clubs new online ticketing service and this also includes booking an extra ticket if a personal assistant is required. All those booking a free PA ticket will be asked to bring proof of disability as random checks will be made before entry to the ground. This has our full backing as we hope it ensures that the new system is not being abused. 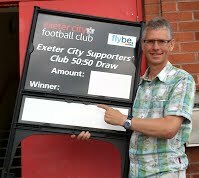 Again this shows that Exeter City is committed in being accessible to all. I don’t like going on about myself but I was asked by Level Playing Field to assist a research team at Loughborough University in a project called FREE (Football Research in an Enlarged Europe funded by the European Commission). They needed supporters who are ‘very active’ in attending matches regularly, and are members of a supporters’ trust. They wanted specific feedback on experiences at football matches (home or away) in terms of accessible facilities and services to the minimum standards that should be provided for disabled fans. Over 8 weeks I had to put together 4 audio diaries, each over 3 days and also show what football means to me through photographs. It was great helping out with this project and I think I’ve put my points across on specific needs and concerns that we all have in relation to access, attitudes, perceptions and all other things. I’ve got to mention about my appointment to the board of trustees at Level Playing Field and now holding a position of Executive Trustee. LPF are a National Supporters’ Origination who looks out for the interest of all supporters with disabilities, not just those who support a football team but all sports fans. LPF are very important as it gives supporters with disabilities a voice at national level and my appointment is a real honour and I truly hope I can do us all and our football club proud. In the past year, I hope as your chairman I’ve done what has been expected of me and if re-appointed I will ensure that our association continues to help and support Exeter City Football Club in any way possible and ensure that all supporters with disabilities and their personal assistants are treated fairly, as you would expect. I would like to take this opportunity to congratulate both David & Jeanne Jones for the award given to them for all their volunteer work they do for Exeter City. The award was presented to them by the Exec100 Club. I personal think it’s well deserved. Finally, I would like to thank our committee members for all their hard work and time given for the benefit of our members and Exeter City over the past season, too Colin Atkins who’s standing down from our committee after giving us 6 years of his life and has been fantastic in helping us raise some great amounts of money over the years and is now ready to put his feet up ‘you deserve it and thank you’. Our members for their continued support and to Exeter City Football Club for allowing us to use their facilities again for free for our meetings and to all of you for attending this year’s AGM and listening! Thank you all for your support.